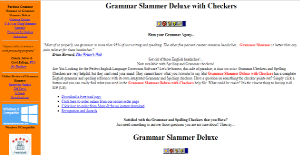 Grammar Slammer is an English grammar and spell check software. It has a quick online English grammar help that assists writers in making intelligible write-ups and content. The software also aids users in understanding grammar rules so they can avoid making the same mistakes in the future. With Grammar Slammer, users can also learn more about the intricacies of the English language as they can gain answers to questions regarding the corrections the software makes. Moreover, Grammar Slammer eradicates the headaches of ensuring compliance with grammatical and syntactical rules. That is because the software points those out for the user to make modifications, thereby giving users the confidence to submit their documents or post updates online. With Grammar Slammer, users can gain a deeper understanding of the grammar and syntax rules in English. The software not only points out mistakes in a user’s content, it also provides explanations as to why what was written was erroneous. On top of that, Grammar Slammer provides access to a complete reference that users can check to ensure that they are observing grammar rules. Spelling words one is not familiar with can be arduous. That is why Grammar Slammer comes with a spelling checker to make certain users use the right spelling style (American or British) and to make sure that words are typed the way they should be. Grammar Slammer’s grammar and spelling reference can be utilized to answer a person’s questions. Users only need to click a button and they can get a succinct explanation regarding their query. Grammar Slammer is not only helpful for users who want to deliver error-free content, it is also friendly to their pockets. The various editions of the software are available at reasonable prices compared to the steep tags similar software have. Grammar Slammer has received high ratings from its users in various rating and review aggregator sites. This provides a peace of mind to new and interested users since they know they are acquiring a software that is proven to be beneficial. Word processors may be equipped with grammar and spelling checkers but they are only basic rules. With Grammar Slammer, users of Microsoft Word can gain more confidence since they can use the software together with the processor. If you are interested in Grammar Slammer it might also be beneficial to investigate other subcategories of Best Grammar Checker Software collected in our database of SaaS software reviews. Since each enterprise has particular business needs, it is sensible for them to abstain from looking for a one-size-fits-all perfect software system. Needless to say, it would be pointless to try to find such a system even among widely used software solutions. The smart thing to do would be to list the various vital factors that need consideration such as key features, budget, skill levels of employees, company size etc. Then, you should do your groundwork thoroughly. Read some Grammar Slammer reviews and investigate each of the other systems in your shortlist in detail. Such comprehensive groundwork can make sure you weed out ill-fitting platforms and zero in on the app that offers all the elements you need for business success. How Much Does Grammar Slammer Cost? Site licenses, schools, and multiple copies have special pricing plans. Request a quote via email. We realize that when you make a decision to buy Grammar Checker Software it’s important not only to see how experts evaluate it in their reviews, but also to find out if the real people and companies that buy it are actually satisfied with the product. That’s why we’ve created our behavior-based Customer Satisfaction Algorithm™ that gathers customer reviews, comments and Grammar Slammer reviews across a wide range of social media sites. The data is then presented in an easy to digest form showing how many people had positive and negative experience with Grammar Slammer. With that information at hand you should be equipped to make an informed buying decision that you won’t regret. What are Grammar Slammer pricing details? What integrations are available for Grammar Slammer? If you need more information about Grammar Slammer or you simply have a question let us know what you need and we’ll forward your request directly to the vendor.